Wow! I had thought my lucky number was 22 but I have come to find out it is 46. Let me explain. I am sure most of you know about Judy Wilkenfeld, a gifted Australian artist, who I spotlighted in this post back in December 2007. Her blog, Red Velvet, is a daily stop for me. 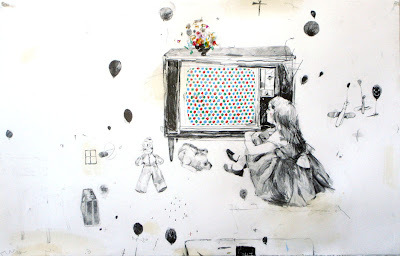 Recently Judy created one of her amazing Visual Anthologies, this one entitled Doll, for a South African couple. You can see from this one shot below what an extraordinary piece this is! So Judy being the generous soul she is decided to have a giveaway on her blog, with the prize being a package of goodies. Being the creative soul that she is, Judy made the giveaway a guessing game. The first three people who guessed the number of pages in Doll correctly would win. There were 63 guesses ranging from 13 to 66 pages. I was the only commenter to guess 46. On July 24, the following picture was posted on Judy's blog. Click on the image to see it clearly. The text on the right reads: And it came to pass after many days and many nights that it was a "he" who guessed right. As the bloggerites fell upon their faces they cried out 'who' from amongst our people has won. And the Red Blogger arose from amongst them and spoke and announced that the man from the land of Alter-ed Pages has been victorious. And the people arose and hailed his victory. Thanks Judy...for your beautiful blog, for your deeply moving creations, for the time you take in sharing all your hard work on your blog, for the amazing gifts you have given to so many, and for this creative and generous giveaway. Cannot wait to see the treasures you send. 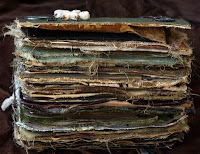 "I also have tons of stuff(marvelous stuff) I CAN NOT bring myself to use-papers, OLD pictures and especially embellishments(things I've bought that I swore I'd use in my altered art-yea right!). My home burned down 12-20-07 so I'm in the midst of rebuilding my stashes-can you recommend places I can get old papers like you received in your "jackpot"? I am so envious of those of you that have such extensive collections of MUST KEEPS! I'm not truly envious-jealous would be the appropriate word, but God is good I'm rebuilding my MUST HAVES AND KEEPS!" The idea of losing one's home and all their belongings (treasured art supplies included) is mind boggling. So, I was hoping that we could help. I have three ideas. First, if you know of any online sources of vintage papers similar to those in this photo, please leave a comment and include the name of and link to the company. 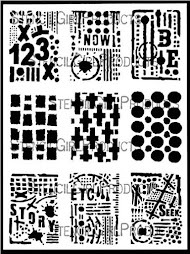 In addition to Ebay and Etsy, I have seen vintage paper/ephemera at Hannah Grey and at Collage Joy. Second, I was hoping that anonymous might email me. If I find out who you are, I would then like to propose step three. I would ask all the artists out there hoarding vintage papers (you know who you are) to mail me a page or two which I would forward in one package. That way, we can help anonymous rebuild the lost stash. What do you think? Let me know if you are interested but don't send anything yet. I will keep you posted when and if I find anonymous. 1. A panel for the display of advertisements in public places, such as alongside highways or on the sides of buildings. 2. The advertisement or message posted on such a panel. 3. An introductory list of highlights from the program or text that follows, as in a broadcast or magazine. 4. 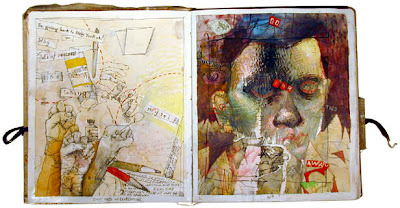 A mixed media book inspired by old, layered, and no-longer-used billboards. Click here to see earlier pages. 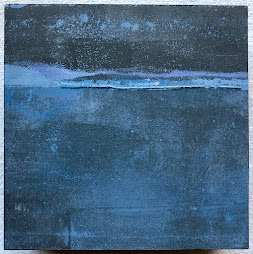 Ingredients: altered paper, altered photograph, ephemera, acrylic paint, dry transfer, pigment and dye ink. 6 1/2" x 3 1/4". Click to enlarge for detail. Some urban photography to bring a splash of color to your day. Thanks go out to artist and blogger Sarah Fishburn who treated me to a color splash of her own when she mailed me a surprise RAK - random act of kindness. Her package included a generous supply of her art postcards and magnets which can be purchased at her Etsy shop. Sarah, along with Angela Cartwright, are the creators of Pasticcio Quartz (QUality ART Zine)and issue #4 was just released. Check it out here. Thanks Sarah! 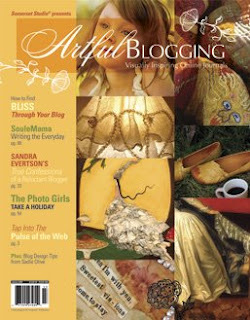 I just received the new, autumn edition of Artful Blogging in the mail and The Altered Page is a featured blog in this issue. 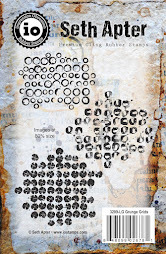 Artful Blogging is a great, well-designed publication put out by Somerset Studio that spotlights artist blogs. I am particularly happy about being in this issue because the editor's theme is the strength of the community of art bloggers and the positive impact blogs can have. I believe that this issue will be available in stores on August 1 but it is certainly worth getting a full subscription, as all the issues have been fantastic. It is time to check your pulse! 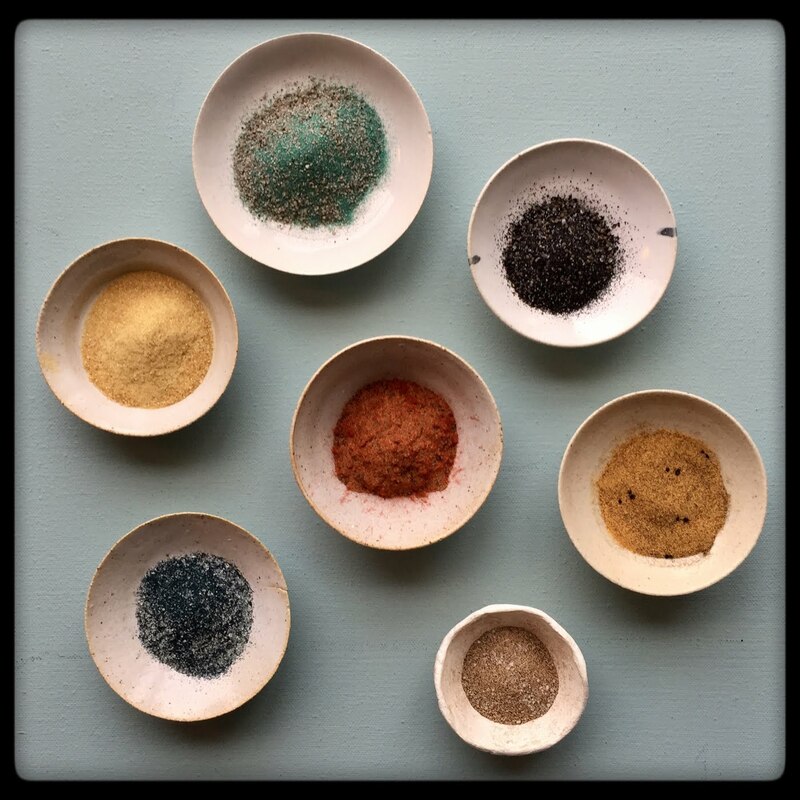 As part of my blog, I organize an ongoing, online project that I call The Pulse. Its aim is to take a snapshot of the web-based, artistic community and to foster greater communication and connection among art lovers and the artists themselves. There are so many talented artists on the web, each with their own unique style and approach to art. With this project, their collective talents can be combined and shared with everyone. 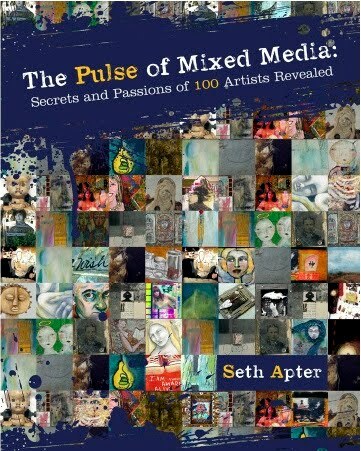 The Pulse began in January 2008 with an Artist Survey that 35 artists participated in. 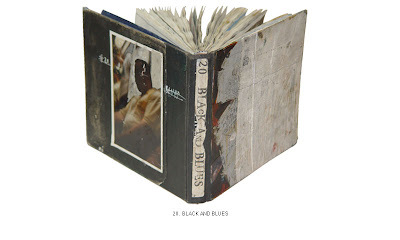 In March 2008, 52 artists joined a game of Playing Favorites. I am now starting to prepare for the third edition of The Pulse. This will be another artist survey, a project I plan to continue to repeat twice yearly. This time, the participants will be asked to answer 7 questions in their own words and sometimes with their own images. Mixed media at its best. This looks to be a big project, as more artists have already signed on than had in the prior two editions. I would love to have as many people participate as possible. If you are an artist with a blog or other website and would like to be included in this survey, please email me using the link in the upper right hand corner. I will send you the questions to answer and will also include a link to your site when the project is posted. The Pulse goes live in August and will be posted over the course of several weeks. More specific dates will be provided soon. I hope that you will join in as a viewer, a participant, or, best of all, both! John Copeland is a New York based artist who is well known for his large-scale, acrylic paintings and graphite works on paper which reflect “how we get along or don’t, social issues, conflict, and how we manage to keep going in this crazy place we live in." Images of undefined faces, skulls, television sets, cartoon characters, airplanes, and animals are repeatedly found in his work. 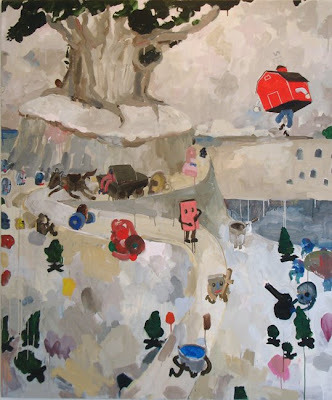 I find many of his paintings to be at once both dark and whimsical. All his work demands closer inspection to see what in fact might be going on. He has exhibited internationally and currently is part of a group show in New York. Having focused on my photographs and journal from Greece since my return, I am just now beginning to get back to some other art projects. I am continuing to concentrate on several collaborations, glimpses of which will no doubt make it into posts soon enough. I am also working on a number of individual projects, all of which you will hear about soon. But for now, I am back on board. Billboard that is. 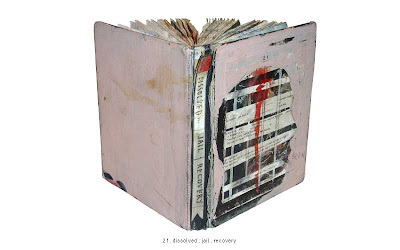 This is a book project rather loosely inspired by both the shape and the visuals of old, previously used billboards. Think layers of paper, text, numbers, and colors. These old billboards become abstract canvases which totally resonate with my love of things with a history, things distressed, things with layers, and things that have been changed by time. Below are images of my newest page with close-up shots and the first three pages that I had already posted in May. Click to enlarge for detail. Ingredients: altered paper, ephemera, acrylic paint, dry transfer, pigment and dye ink, packing tape, altered photograph, electrical tape, sharpie, found builders tape, pen. 6 1/2" x 3 1/4". After I return home from travelling, I carry with me many memories of all parts of the experience. Perhaps most vivid of all are the memories of the people I have travelled with and those that I have met on the journey. For my trip to Greece I decided that I needed to find a way to capture these memories. I brought along sheets of handmade and watercolor paper that I had painted with acrylics, pigment inks, or walnut ink. I handed these sheets to the people I met on this trip and asked them to write whatever they wanted: a thought, a favorite saying, a memory, anything. I bound these sheets into the second half of the journal and have included some bits and pieces below. In this way, my new friends are now with me all the time. Thanks to all my blog readers who joined me on this adventure and a special thanks to those who commented on my posts about Greece. These "conversations" allowed me to feel almost as if I were still on vacation. Almost. Thanks also to Chris Miser, Lynne Hoppe, and Laura Pace, each of whom linked to some of my Greece posts on their own wonderful blogs.